With the addition of the Armata tank in 2015, the Russian army will usher in a new era of universal combat platforms that will be used as the base for the production of all tanks and combat vehicles. The modernization of the Russian army is entering a new phase, with the country’s armed forces undergoing a standardization process in various forms. This includes ground troops, where the development of universal combat platforms for tanks and combat vehicles is in progress. Victor Murakhovsky, an expert in the armament of armored force vehicles, says that standardization simplifies operations, as well as the use of technology in combat. Much like with LEGO bricks, a single chassis can be used to change modules and special equipment without having to make any serious alterations to the design of the machine itself. According to the expert, the project is being developed across three main spheres. In the field of heavy equipment weighing up to 60 tons, the project is called Armata. The result will be the creation of a new main battle tank – a heavy infantry combat vehicle that belongs to the family of Russian army engineering technology. Armata is a project whose details are no less secret than the fifth-generation T-50 aircraft project was some time ago. The only thing that is known about the new tank is that it will have an unmanned turret. The crew will operate from an isolated armored capsule, which will enhance protection from enemy fire. Testing of the new tank will begin next year, and deliveries to the army will take place in 2015-2020. Around the same time, according to Russian Deputy Prime Minister Dmitry Rogozin, the new tank will be shown at the Victory Day parade on Moscow’s Red Square. The Ministry of Defense plans to receive at least 2,300 of these vehicles. The next sphere is a line of armored vehicles that weigh up to 25 tons: Boomerang and Kurganets. The main feature of these vehicles will be the fact that the engine will be located in the front instead of in the rear. This will both protect the crew from direct enemy fire and will allow for the placement of full troop compartments in the back of the vehicle. Personnel will exit the vehicle via doors that swing open or a hinged ramp. The last sphere comprises a light military vehicle called Typhoon. In many ways, this vehicle is futuristic in appearance: It is an entire family of multifunctional vehicle platforms. The “simplest” vehicle is an armored multi-axle car that is to be used to transport military personnel. Its basic characteristics: the ability to overcome water obstacles deeper than two meters and a cross-country speed of over 100 kilometers per hour. Inside the armored box truck, special anti-mine seats for personnel line the sides. The seats are designed to protect military personnel from explosions if the vehicle rolls over a bomb. All chairs have an ergonomic basis, fully following the outline of the human back. The seats are equipped with military belts similar to those found in race cars. Moreover, all the seats in the crew compartment are attached to the ceiling of the vehicle with special arcs. This design is particularly impressive in terms of protection against landmines. These machines are fully computerized. Inside the crew compartment, LCD screens display technical information about the vehicle and also broadcast directly from cameras located outside the car. Even when there is a complete loss of visibility, the Typhoon can be directed to the battlefield with instruments alone. Another requirement for modern combat vehicles is modularity. There are ten different types of two-, three-, and four-axle trucks in the new KAMAZ Mustang family alone. KAMAZ has created its own armored car called Vystrel, based on this family of trucks. There is even an amphibious version of the truck, which is meant to replace the legendary and “indispensible” GAZ-66. Each line features complete interchangeability of parts and mechanisms in order to facilitate repair in the field. The company also offers a platform for assembling weapons systems. For example, the four-axle hauling unit is part of a Pantsir self-propelled anti-aircraft gun missile system. This module weighs 24 tons. The Russian Ministry of Defense hopes that the emergence of a new family of standardized combat platforms will significantly reduce the cost of maintaining the fleet and will also increase efficiency, since the same chassis can be used for complementary combat units within one army division. Such solutions will also offer excellent export prospects. After all, not every customer needs just a crawler tractor or just a rolling vehicle. The modular design makes it possible to mount a combat unit on any chassis. For example, the Armor gun anti-aircraft missile system is based on the KAMAZ wheel chassis and can also be used on a crawler chassis or as a stationary unit. 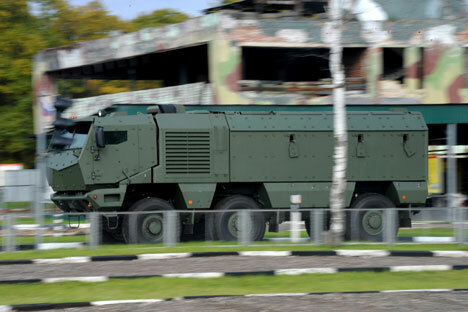 However, despite their export potential, these vehicles are unlikely to be supplied to foreign clients before the Russian Armed Forces are equipped with them.